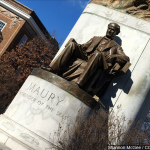 RICHMOND, Va. (AP) – A commission studying what to do with Richmond’s Confederate monuments has scheduled two public meetings to get additional community input. The meetings will be held Thursday and Saturday, May 19. A press release from Richmond Mayor Levar Stoney’s office says the meetings will provide a chance to review input solicited so far and take additional comments. The commission is concluding its public engagement phase and preparing to compile a report for the mayor. It has been considering a range of options, from adding context to the monuments to removing or relocating them. Dealing with the monuments will likely to be a long process. A state law at the center of a lawsuit in Charlottesville prohibits the removal of monuments to war veterans, and the General Assembly has shown little interest in changing it.